Liberty Bank Building | WALSH Construction Co.
Seattle Central District’s Liberty Bank opened in 1968 as the West Coast’s only black-owned bank. The bank was founded in response to a trend of redlining and disinvestment and stood as a symbol of empowerment, proudly providing financial services to people and businesses who otherwise couldn’t obtain them. 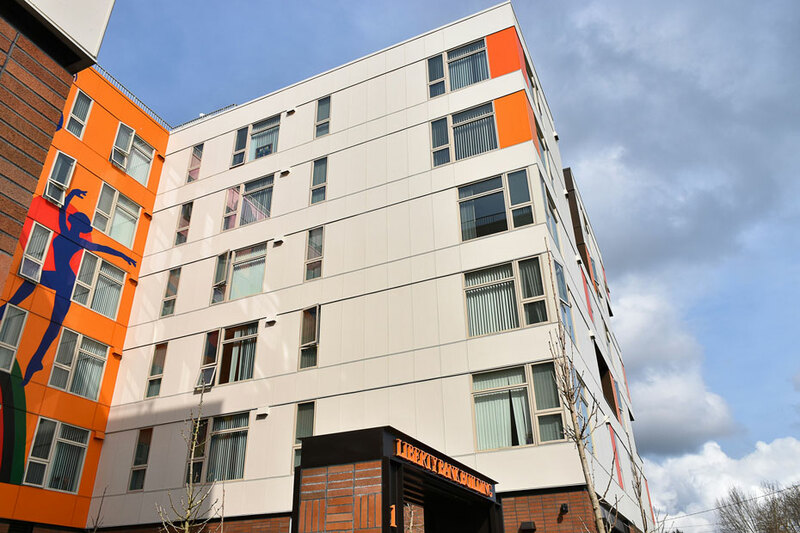 Key Bank eventually bought the building and in 2015 sold the property below market value to Capitol Hill Housing with the intention of honoring the community’s history by having the site transformed into affordable housing. The new 101,046 SF building has 115 affordable units, available to people earning between 30%, 50% and 60% of the area median income. There is also 2,695 SF of affordable retail space available to small local businesses. Special features will include a workroom, lounge and an approximately 3,000 SF rooftop deck. 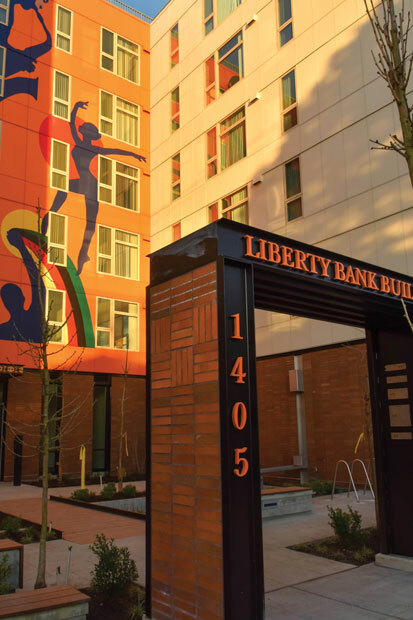 The building features artwork inspired by the history of the Central District, led by a team of artists under the leadership of Al Doggett and Esther Ervine. Nine artists will create eleven pieces of art reflecting the community’s cultural heritage and an “ancestral connection to Africa.” Al Doggett recounted “I had a chance to see [the bank] functioning and see how it did help out businesses,” adding, “a few of the artists are assigned to give some history of the bank itself and how it played a role in the community.” At street level, a brick veneer will be constructed, incorporating some of the salvages bricks from the original Liberty Bank. The project is a collaboration between Africatown-Central District Preservation and Development Society, Black Community Impace Alliance, Capitol Hill Housing and Byrd Barr Place (fka Centerstone) and is a community-led development that commemorates the end of slavery in the United States, acts as a tribute to the end of redlining loans in the Central District, and promotes inclusivity. The project partners have expressed their commitment to seeing the jobs created by this project be filled by people in the community. “One of the biggest things that I’ve been pushing for, that we’re all pushing for, is to make sure when there’re people on the job site, they look like our community, they look like us,” said Jaebadiah Gardner, assistant project manager for Capitol Hill Housing. 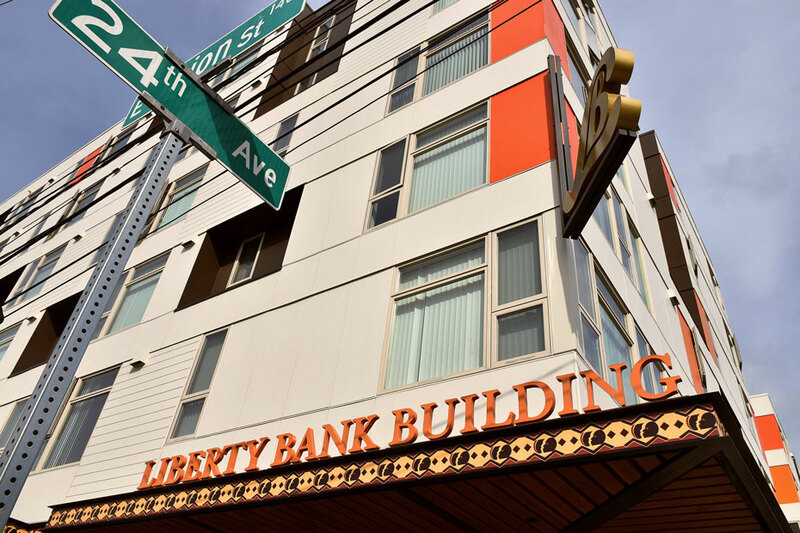 Liberty Bank was a symbol of fortitude and empowerment for the Central District Community of decades. The redevelopment of the building will reinstate the site’s long tradition of giving back to the community and pushing back on displacement and gentrification.